The Mountain laurel, (Kalmia latifolia) is the state flower of both Connecticut  and Pennsylvania. In Connecticut, the Mountain laurel was designated as the State Flower by the General Assembly in 1907. 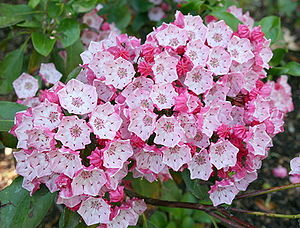 Pennsylvania named the Mountain laurel their state flower by an act of the General Assembly on May 5, 1933. Mountain laurel is a perrenial native shrub which varies from four to ten feet in height, although it can reach heights of up to 40 feet tall. The most common Mountain laurels have many fragrant small pink and white blossoms and dark green leaves that grow about one inch across and up to 5 inches long, although some have flowers in shades of white or purple or other colors. It is commonly found growing on rocky hilltops and similar areas. It grows in many eastern and southeastern states in the United States. The Mountain laurel is a member of the heath family (Ericaceae) which contains shrubs including huckleberry, blueberry, azalea, cranberry and rhododendron. Mountain laurel normally begins to bloom late in May and into June. Mountain Laurel plants can also be grown in backyards and other areas. The shrub will tolerate shade, but the flowers will bloom better with a little sunlight. It can be grown in rocky, acidic soil that is moist but well-drained. Laurel Falls waterfall in the Great Smoky Mountains is named for the Mountain laurel, which grows in abundance in the area. This page was last modified on 27 June 2016, at 20:15.